The Children of the Sun Foundation is currently holding a transmission/meditation for Fukushima. To learn more about what they are doing, please click here. Their transmission is ongoing, so it's okay to drop in at any point. It doesn't matter which meditation you do, what's important is adding your loving energy to the energy of everyone else connecting to Fukushima in meditation. Whether you are new to meditation or have been meditating for many years, here are some ideas and simple instructions to assist you in amplifying and sending positive energy to Fukushima to affect a desired outcome. It would be a good idea before you begin to make a list of at least five things in your life that you have gratitude for. If you find it challenging to come up with good list, click here for some ideas. First, find a quiet place without distractions from any other people, pets, phones, or anything else that can disrupt your focus. Get into a comfortable, upright position. It is best to sit up during the meditation. Otherwise you may fall asleep unintentionally. Begin by watching your breath. You can count your breaths, in and out, in and out. Become aware of the sensations in your body. Feel the seat against your legs and your back, supporting you. Feel your feet against the floor. Stay as focused as you can on your breathing and sensation. This will keep you in awareness of the present moment. If you drift away in a stream of thought, that's alright. Gently bring yourself back to the awareness of your breath, of sensation. When you are in a relaxed and aware state, you are ready to begin the exercise. One by one, bring into your awareness things, people, events that you are grateful for. Really let yourself feel the love and gratitude for each person, place, thing, event.. Once you have connected to a feeling of deep gratitude and love for something or someone, visualize it dropping into your heart. Then, focus on something else you love and are grateful for. Once you have really connected to it, drop it into your heart again. Feel your heart getting bigger and more energized with love and gratitude. When you feel every cell in your body singing out with love and gratitude, it's time to turn your focus on Japan and Fukushima. With a picture of Fukushima in your mind, visualize your love and gratitude - which is now ringing and lighting up every cell in your body - exploding out with great speed and joy straight to Fukushima. 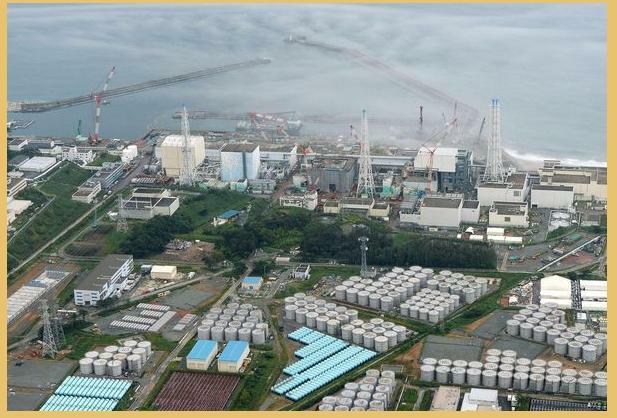 It crosses the distance in seconds, bathing Japan in a beautiful white light, protecting all the reactors at Fukushima and everyone who is on that site. Visualize this light mixing with and amplifying the light from every other person meditating for Fukushima. Feel the power of the light grow and grow exponentially. You are one with every one else meditating. Feel that peace, calming the storms. This light protects the containers holding all the radioactive waste at Fukushima. It penetrates deep into the ground, reinforcing it from mudslides, protecting the groundwater from contamination, penetrating deep underground, forming an underground barrier that nothing can penetrate. It quells, quiets and reduces all the radiation levels at Fukushima and beyond. This light knows what needs to be done and moves in all directions, healing, reinforcing, protecting. Visualize this beautiful light surrounding Japan and Fukushima getting brighter and brighter, moving out to sea, protecting the ocean water and all the sea life, counteracting all the damage done to this point. This light creates a barrier that typhoons cannot penetrate. This barrier shifts the direction of the typhoons off-shore, where every drop of rain becomes entangled with the light of love and gratitude, falling into the ocean, infusing the sea water with the light of great love, protection and deep healing. This light comes from your heart and the heart of every person meditating. You are one with this light. You are this light. This light has the power to do anything, because this is the light of pure love. There is nothing more powerful than this in all the universe. Know this. Feel this in your heart with deep understanding and gratitude. See this take place in your mind's eye, knowing you are effecting great change for good. Love is the force that binds the universe and you have used this force with the intention of healing, shifting energies from chaotic and destructive to peaceful, focused and constructive. Feel this in your heart. Feel the gratitude and peace that comes from this knowing. And as you move away now from Fukushima, from Japan, back now into your own space, know beyond a shadow of a doubt that you have effected great positive changes, for when two or more come together with a single purpose in love there is nothing that cannot be accomplished. Our Deep Gratitude to You. Thank you for using your infinite power to heal in this way. Please do this meditation as often as you can throughout the weekend. "Circumstances Don't Matter. Only My State Of Being Matters." Repeat this to yourself often. Write it on a stickie note and place it where you can see it so you wont forget it. This statement is a reminder not to look outside your self for validation that this meditation has worked. The world is a mirror, reflecting your beliefs about reality back to you. Believe that you are that powerful. Be the change you want to see in the world, and that change will be reflected back to you. Trust in your self and it will be so.